How many 8-year-olds you know can whip up a gourmet meal? Little Estie Kung certainly can! The youngest contestant on a brand-new culinary competition series, Man vs Child: Chef Showdown, Estie holds her own against other contestants as well as fully-trained professional chefs with ease. Proving without a doubt that she is More Than #JustAKid, this pint-sized chef has a finely-tuned palate to go with her cooking skills. A huge Harry Potter fan, Estie names her cooking utensils (meet Count Spatula!) and hopes to write her own cookbook one day to inspire kids to be more adventurous with food. Now you can see this extraordinary child live in action at the Man vs Child: Chef Showdown event, hosted by the lovely and lively Azura Zainal! Entrance is free! “Man vs. Child: Chef Showdown is an A+E Networks® original format and we think it will really resonate with the audiences in Asia. Child prodigies and cooking competition shows have already proven their popularity on Lifetime and this show has both of those ingredients (pun intended)! It’s wholesome entertainment for the entire family in a region where people are passionate about their food. We’re launching our More Than #JustAKid campaign in celebration of children on Lifetime. Our aim is to showcase exceptional kids who prove that what young ones lack in experience, they make up for with creativity and enthusiasm. If given the chance, children will usually exceed expectations of grown-ups,” said Michele Schofield, Senior Vice President, Programming & Production, A+E Networks Asia. 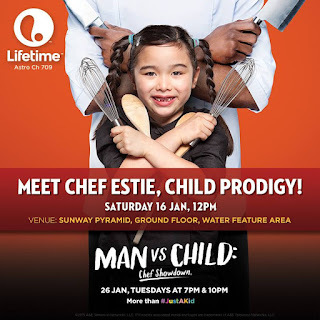 Catch Estie on Man vs Child: Chef Showdown which premieres on 26 January at 7pm, exclusively on Lifetime (Astro Ch 709). In each nail-biting episode, watch young chefs aged 7-14 pit their considerable skills against fully-trained and accomplished chefs – the results are sure to surprise you!